This festival season, if you want to bring a change into your routine, you might consider taking off on a sight-seeing trip to an exotic location, where you can while away the tedium by losing yourself in the sights and sounds. We've picked the exotic former royal capital of Laos. Join us as we explore its wonders. We had been planning a trip to Laos for a long time, and the opportunity finally presented itself after my son Dibbo's final examinations ended. We arranged our visas from Bangkok, and on July 15, we set off for the city of Luang Phabang. The oldest recorded name for Luang Phabang was Muang Xua. Muang is ancient Lao for 'realm', so a loose translation of Muang Luang Phabang is "The city of the Grand Buddha". As the story goes, one that was recorded in the ancient palm-leaf manuscripts called bailan, Buddha smiled as he rested on the soil of Luang Phabang. To his disciple Ananda, who had asked the reason for his contentment, the Buddha replied, "A rich and powerful capital will be erected here." Indeed, Luang Phabang became the ancient royal capital of Laos. This 600-year-old city is a visual feast, with its beautiful Buddhist temples, its majestic French-colonial mansions, and its quaint teakwood houses nestled in the groves of swaying coconut palms. We got our first glimpse of this hilly city from the aeroplane. We saw the hills dotted with bungalow-type houses, with the rust-orange Mekong river, laden with sleek boats, wending its way through the city. After a flight of an hour and a half, we finally reached our destination. The airport was small and cosy, tucked between the green hills, far from the blare of noisy traffic. This historic city, with a population of only a few thousands, is a place of fragile beauty, particularly vulnerable to change, brought about by an influx of visitors who flock to experience its many breathtaking sights. One of the first such sights that greets the visitors upon their arrival to Luang Pabang, is that of the Phu Si mountain, which is the geographical and spiritual centre of the city. Once rumoured to be the dwelling-place of a powerful naga, it is also sometimes seen as a miniature Mount Meru, the Mount Olympus of Hindu-Buddhist cosmology. Phu Si, topped by a golden stupa, and is striking from a distance. The northern city of Luang Phabang, once the royal capital of Laos, is now a sleepy, yet charming town, set beside the Mekong River, which happens to be the twelfth longest river in the world. Its residents, numbered at around 130,00 live life pretty much they way they had when the French explorers first encountered them in the 19th century. In the mist of the early morning hours, the natives in their traditional garb crowd the market to buy tropical fruits while lines of saffron-robed Buddhist monks stroll down the narrow lanes to receive alms from the faithful. The architecture of this city is a fabulous fusion of ancient Laos, French, Vietnamese and Chinese styles. During the colonial period, brick-built urban edifices in the French style began to appear next to the traditional stilted houses. Vietnamese builders were brought in for this project, and many settled down permanently into the area, adding to it their own styles. Chinese merchants who flocked to the area also set up shops, and it all worked to give Luang Phabang a character of its own. 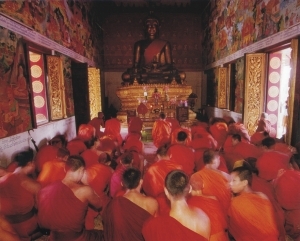 Since its foundation, Luang Phabang, whose art is essentially religious, has seen over sixty-five Buddhist monasteries (vat) built within the city walls. The majority of these have now disappeared over time, due to war, the ravages of time, fire (as most of these were made of wood), and most importantly, the sacking of the city in 1887. Those that remain are still breathtakingly beautiful, like the Wat Xieng Thong, with its gracefully sloping roof, and gold-patterned maroon walls. Adjacent to this temple is the Funerary Carriage Hall, or the haw latsalot. Built in 1962, the hall's teakwood panels are deeply engraved with depictions of characters from the Lao version of the Ramayana. The former Royal Palace has now been converted into a museum, an eclectic blend of French and Lao architecture. It houses many artefacts of artistic and historic value, including rare articles of royal regalia, like ornate scabbards and saddles and the Pra Bang, the sacred Buddha image that gave Luang Phabang its name. Our journey took us to many wonderful places. We took a 30km boat ride upriver to the Pak Ou Caves, which contain thousands of antique Buddha images. Visitors can also explore a number of villages in the locality. We went to the caves by boat, and our guide Mr. Sing talked about the heritage of the people there. 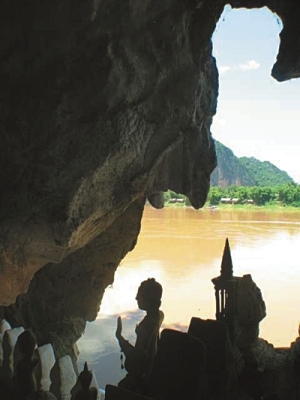 The caves are a popular spot for Buddhist pilgrims during the Lao New Year festivities in April. They flock here to take part in a spiritual cleansing ritual enacted by bathing the Buddha images. It was a sunny day when we went, and the river was very calm, cool, and quiet, and made for some unforgettable memories. Across the river from the Pak Ou Caves, we stopped at the Whiskey village, which, as the name suggests, is famed for its potent rice whiskey. Shopping in Luang Phabang also proved to be an amazing adventure. Home to numerous skilled artisans who produced objects of silver and textile products of cotton and silk for the royal court of old, it is definitely worth exploring. One can buy hammered-silver utensils and crockery of superior quality directly from the expert silversmiths. Ban Phanom, a village located a few hours outside Luang Phabang is a textile paradise, where you can get everything from hats to blankets. Luang Phabang has been described as Southeast Asia's best preserved ancient city, and it recently received the World Heritage award from UNESCO, a move that will ensure that Luang Phabang remains pristine for generations to come. With vibrant vistas, mind boggling art and great shopping, a visit to this city is an unforgettable experience.